‘Gonna Sing, Gonna Dance’ starts things off in classic style with Contessa suggesting her “music went out of trend” as she tells a tale of how she was told she “should not sing and get a job”. This mix of self-depreciation and slight passive-aggressiveness is set to a tune that could have been lifted straight from the first two Stray Cats LPs. Mr. Delta backs her very confidently with a guitar line that combines a descending scale with some no-nonsense rockabilly shuffling, while the bass slaps hard and everything resembles a second wave rockabilly soiree. When it comes to the featured solo, Mr. Delta isn’t exactly Bryan Setzer or The Long Tall Texans‘ Matt Windler, but his fast and dirty style – complete with a couple of bum notes accentuating the live feel of the recording – has a genuine sense of spontaneity. Better, shorter and sharper, ‘My Cadillac’ adopts a classic rock ‘n’ roll twang and a great walking bassline. The mood is somewhat formulaic but the music still thrills when pitched against a sassy vocal, with a harsher guitar driving everything in classic style: the rhythm has a great reverb and twang, the lead a much tighter approach, while a solid rhythm section holds everything together. Although playing in a somewhat melodic style, bassist The Racer demonstrates a brilliant slapping sound on the occasions the music drops back enough to allow his four strings to truly be heard. A rock ‘n’ roll pastiche, ‘Julie, is hampered by a hard accent but again showcases the sound of a band who truly love all things 50s and really believe in themselves. This time around, their sound is augmented by a stabbing piano courtesy of Mattia Conigliaro and although appearing far too low in the mix, he provides an integral part of this homage, before the slapping and strutting ‘The Colt’ fuses rockabilly with occasional honky tonk country elements. In terms of the full picture, this is the EP highlight; the reverbed guitar leads are perfect and the basslines are hard and pointed; Behind the snare, drummer The Butcher’s preferred style drives everything with a pleasingly retro rattle – and The Contessa herself totally owns these two minutes, crying in a manner that really demonstrates a retro cool. These four songs play very much to melodic psychobilly traditions and, as such, leave behind something you’ve often heard before – sometimes better, sometimes not. Despite potential over-familiarity, however, the live sound of the recording and Contessa’s undeniable ebullience help to see these four tunes off in style. 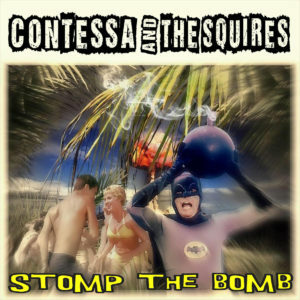 Safe and dependable as it may be for rockabilly vibes, ‘Stomp The Bomb’ is still recommended listening. This entry was posted in Album & EP Reviews and tagged independent, italy, rockabilly, stream by Real Gone. Bookmark the permalink.